When I saw the title of longtime syndicated newspaper columnist and author Rheta Grimsley Johnson’s latest book, Hank Hung the Moon and Warmed Our Cold, Cold Hearts, I wondered why anyone would want to write about Williams Sr. The singer has been thoroughly-documented; I couldn’t imagine another biography. Johnson, of course, has been warming hearts for years with her hilarious, heartfelt, and melancholy observations of everyday people who add color to the world. 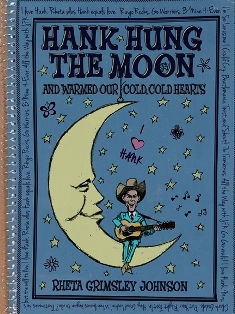 In Hank Hung the Moon, she does reveal a few new tidbits about “Ol’ Hank,” as she lovingly refers to him, but more importantly, she invites the reader to look at the different styles of music that defined the ups and downs in her life, though she admits that Hank will always be her favorite. There’s more than music in the Delta, however, including a Chinese grocery called The Star-Reka with a classic Johnson twist: “The Chinese butcher there was known for his whimsical meat case, replete with meat sculptures—raw and red ground beef shaped like a cow one week, pork sculpted into a convincing pig the next. Having grown up a butcher’s daughter, I have and always had a true and abiding appreciation for meat; I just never realized till then you could treat it as art.” A few paragraphs later, Johnson sends a jolting shiver down the spine as she tells of a young, aggressive colleague in Greenville whom she greatly respected for his “zest” for reporting. The fellow was so desperate to climb the ladder in the newspaper business that he committed the unforgiveable sin of manufacturing quotes. Realizing that his journalism career was perhaps forever tainted, the young man tragically took his own life. The inspiration for the book was a box marked “HANK” that she found in the attic of a home she shared with her late second husband, Don Grierson, a UAB professor of journalism who had begun working on a book in the early 1980s about Hank Williams as a literary study with his ex-wife, the poet Pat Grierson. Pat passed away only a few months before Don died and the project was never finished. The box was a treasure trove of interviews with Grand Ole Opry stars, as well as stories, essays, and poems about the singer.